These grilled green beans have that unmistakable Asian sesame flavor and make an awesome side dish with chicken, beef and fish. They've got a nice spicy edge to them with the Sambal Oelek or Asian Chili Garlic sauce available at most supermarkets. 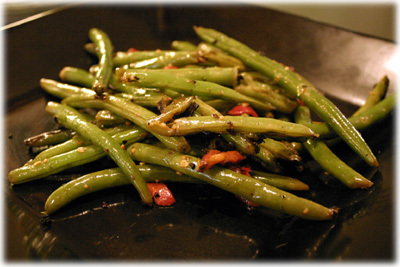 You'll also want to grill these green beans at very high heat for a short period of time. 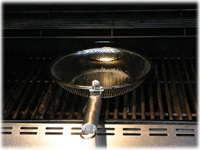 Use a perforated grilling wok, also availble now at most hardware and BBQ stores. These woks are versatile and you'll use it a lot. 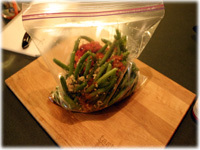 Wash and trim the ends of the green beans and place them in a resealable plastic bag. Add the chopped roasted red pepper to the bag with the green beans. Combine the sesame oil, sambal oelek and minced garlic and add to the bag with the beans and red pepper. Gently shake or manipulate the bag so all the green beans are covered in the marinade. Spray cooking spray to the perforated grill wok (not when it's on the lit grill!) and place it on the grill to heat up. When the grills reached cooking temperature place the green beans in the wok and gently stir to evenly disburse. Close the lid. After several minutes lift the lid and stir. 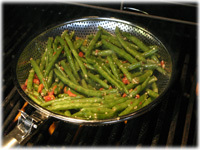 Continue to stir until the green beans begin to soften slightly and develop slightly charred grilling marks. 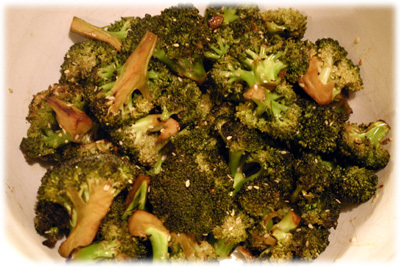 Remove from the grill to a serving platter, sprinkle with sesame seeds and serve.